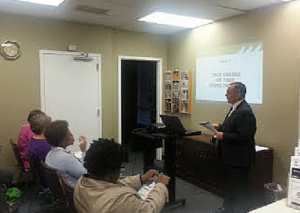 This month we held the second of our financial mentoring workshops. We held this workshop jointly with UCM, where our two agencies brought nearly 20 of our clients to the workshop this past Wednesday evening. Facilitated by three bankers from Andrews Federal Credit Union (from its branch in the Springfield Town Center), the workshop taught the clients about budgeting, credit management, and savings. The best part of the evening was the planned followup by the bankers with several of our clients. They are planning to meet with them one-on-one and continue to work on their budgeting skills.